First things first: if you get your history from movies you get the history you deserve. 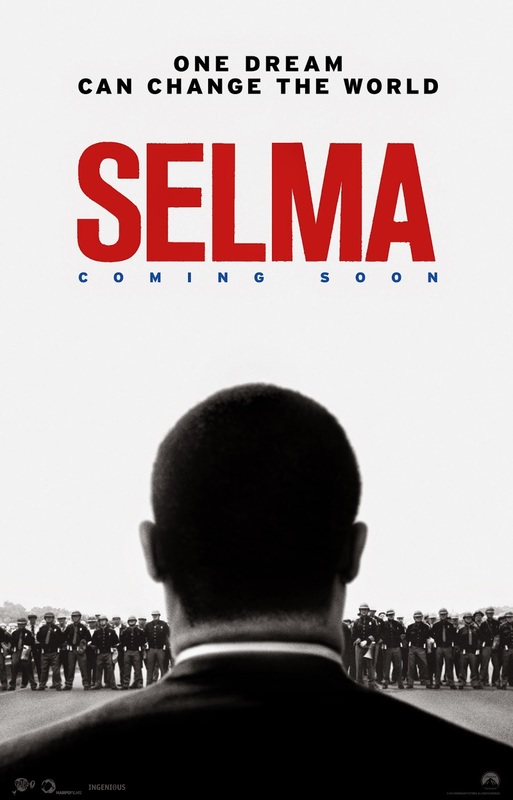 Amid the controversy of historical inaccuracies that feel more like a play to dismantle Selma's award chances than anything else it must be remembered that director Ava DuVernay's is an interpretation of many historical narratives boiled down into a comprehensive two hours. Things must be compacted and slightly compromised, but never does it feel like any one character is given the shaft more than the others. The flurry of controversy here is dealing with the portrayal of the thirty-sixth President, Lyndon B. Johnson, who is historically regarded as completely behind not only Dr. King, but the civil rights movement in general and the passing of the voting-rights act in 1965. The movie doesn't portray a President resistant to the passing of this legislation, but more a man who has a set of priorities not in line with our protagonists. The extent to which this is true or not certainly matters, but more to the point of the films major goals is that this is not a movie about the relationship between Johnson and King (which a very interesting movie could be made from), but rather larger issues at hand to the point I'd say Selma isn't about Dr. King either. More, it is about a movement, a moment in time that is compelling and inspiring enough to make for a good story and serve as a nice reminder and a bit of perspective especially considering the relevancy of the message it's preaching. Despite all of this controversy swirling around it, the actual content of the film is what matters and that is where the dispute between telling history as accurately as possible and telling a good story comes into play. There is no one clearly defined version of history despite what we are taught to believe in grade school and so it is completely open and fair for DuVernay (working from a script by first-time screenwriter Paul Webb) to tell this story from her own perspective, influenced by her own ideologies. It may be slightly unfortunate that her interpretation isn't completely fair to Johnson, but I doubt this will tarnish his legacy in the grand scheme of things. The film itself and what is actually the subject of this review is a rousing, expertly paced film that truly has the ability to inspire despite its structural conventions. The film itself is a solid four-star historical drama that is elevated to perfection by David Oyelowo's exceptional performance. 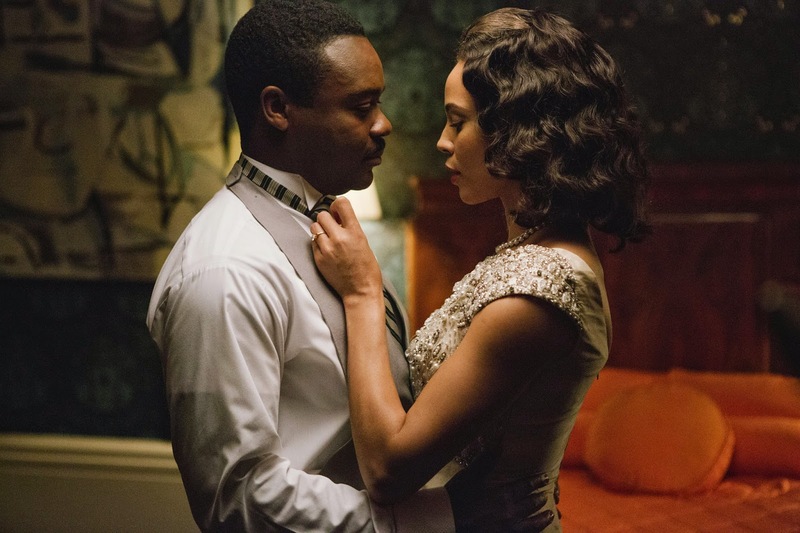 Martin Luther King (David Oyelowo) and wife Coretta (Carmen Ejogo) share a moment in Selma. Beginning in 1964 when King (Oyelowo) was awarded the Nobel Peace Prize for his dynamic leadership of the Civil Rights movement, the film immediately touches on a conversation that paints a portrait of the understanding and balance that King had not only for his image, but for what he felt a responsibility to represent. He has a perspective like no other around him and is appreciated by people in power for his methods of leading his movement peacefully. First and foremost he is that: a leader, a well-respected voice and a figure for those like him to trust and put their hopes in. He bears a burden as big as any man in history, but he carries it as Christ did the cross: with an understanding that his potential suffering will speak volumes to those who don't yet understand. Oyelowo captures this psychology, this outlook, this disposition with as genuine a representation as can be imagined. Earlier this year I described Chadwick Boseman's portrayal of the Godfather of Soul as less an imitation and more a second nature within the actor, a persona he inherently understood and could turn to with ease and the same thing could very easily be said about Oyelowo's performance here. Not only does he embody Martin Luther King Jr., but he reaches a point when making the activists famous speeches (speeches that have been changed and re-written due to issues of owning the actual text) where we believe we are watching actual footage of King rousing his troops, inspiring his legions and perfectly articulating what action is necessary and why. More importantly we see the intelligence that resides within the man as he is willing to lend his vision to others so that they may understand the scope of their actions and the possible repercussions necessary to make their point. He is asking for sacrifices, pleading with those who agree with his stance to do as he does and walk into an uncertain future, but he never underscores their willingness by holding out his motivations. I found this more compelling than anything as the politics behind the scenes, not only with LBJ, but with local sheriffs, governors and judges to be something someone in a position like King might want to keep behind closed doors, but instead of creating what could be future mistakes he conveys the full situation and its circumstances to his followers which in turn gains and maintains an unwavering loyalty. Selma really picks up after the 1963 bombing of the 16th Street Baptist Church in Birmingham. This event, depicted in the film with shattering bluntness and emphasizing the loss of innocence for no other reason than hate is a catalyst for the actions that Selma chronicles. DuVernay is intent on leaving a mark on the viewer immediately and she does so by strongly letting the visuals speak for themselves in her depiction of the aftermath of this bombing. It resonates and it stays with you as everything else in the film unfolds. As we only see more injustice done and more hate spewed it is the thought of these unsuspecting and innocent young girls on their way to church who were taken away in the blink of an eye that hangs over the proceedings and serves as a constant reminder for the sometimes extreme tactics used. Intimidation and fear are the two biggest factors working against King and his people and he understands that, but more the film communicates why voting was such a major point when blacks technically already had the right to vote. In the south, things were still very much segregated in the mid-sixties and there were road blocks keeping blacks out of the voting booths as officials used such tactics as the aforementioned fear and intimidation. The President offers his help to King's cause in which King requests assistance in gaining legislation for blacks to have the right to vote unencumbered with a federal protocol eliminating the dismissal and denial of blacks seeking that right with strong enforcement of that protocol to boot. Not in the same boat with King and looking to take on the issue of poverty before voting, this is where the film shows Johnson as being resistant. King makes a clear point that the voting act is necessary due to the amount of racially motivated murders taking place in the south and the lack of any legal repercussions for these actions due to the all white officials that are elected by all white voters and in the rare instance a case goes to trial the accused are freed by the all white juries because to be eligible to serve on a jury one must be a registered voter. While Johnson concedes that he has much to think about and much work to do in the south, this issue in particular will have to wait essentially serving as the reasoning for King and his company to travel to Selma. Dr. King, along with many of his supporters, march from Selma to Montgomery, AL. in an effort to gain equal voting rights. Selma is purely a strategic location where enough groundwork had been laid and the necessary parts were all in motion for King to rally demonstrations where he could show the rest of the world what these southern politicians wanted to keep behind closed doors. In this approach, DuVernay has a story that is all about the politics and logistics of planning a precise attack using intelligence over brawn and she gauges this angle to great effect by having many scenes where the dialogue is stronger than if we were seeing the things people are talking about play out. This is especially true of when King convinces two young activists already firmly planted in Selma's fight for equality that he is not there to take over their efforts, but merely that it is the best option in terms of getting their point of view to a wider audience. To think that King was above plotting and strategizing is to demote his intelligence to that of a naive, angry man who operated on knee-jerk reactions. King was anything but and when DuVernay uses her stacked cast to illustrate this angle through sophisticated and highly eloquent dialogue the film excels. This is not to discount her sense of visual storytelling though as this is mustered to full effect when necessary. In the high point of the films emotionality and physical brutality we witness a recreation of the "Bloody Sunday" march across the Edmund Pettus bridge where six hundred marchers were attacked by state and local police with billy clubs and tear gas. DuVernay, who I've not seen any previous work from, has a distinct visual style that very much relies on the distinct framing of her subjects. In the documentation of this first march that resorts to a horror show she wisely allows the billowing smoke of the tear gas to fill the screen with only random body parts breaking through as some run and some chase after. It is very much in the vein of something you would see in a scary movie and the horror it indeed conjures up from a viewer perspective is so strong it created knots in the pit of my stomach. There is an inherent importance, rage and vitality to the filmmaking on display here whereas something like last years The Butler felt it thrust those qualities upon itself. 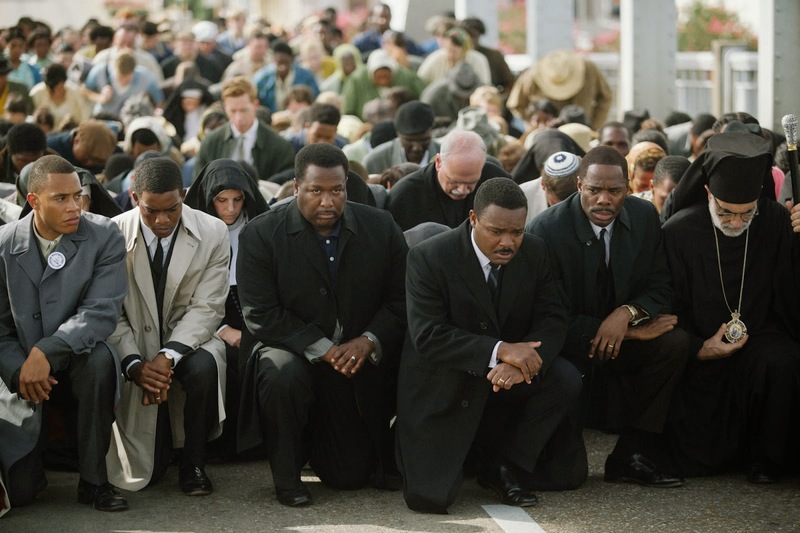 Selma shook me to my core, it conjured up feelings of wanting to do more and it so specifically kept its goals in focus that the power it carries will be felt for a long time to come.